The SM106 DC.-DC. Converter module has been designed to convert a noisy vehicle battery source between 20V to 55V D.C. to a filtered 12V D.C. output. It is suitable for a wide range of sensitive electronic equipment being used in harsh electrical environments. This includes appliances such as surveillance cameras, flat screen monitors, and GPS navigation equipment. Its size is 75mm high (including terminals), 114mm wide (including heatsink) and 145mm long (including the flange mount) The enclosure features a rubber seal to prevent water ingress from hose-down cleaning. The three stage filtering system provides protection against high voltage transients that are present in electric forklifts and large trucks. A blend of switch-mode and linear voltage regulation ensures low power dissipation and low output noise. Output is fixed at 12V with a 2.5Amp continuous loading (3Amp peak loading). Input and Output fuses provide over-current, over-voltage and reverse polarity protection. A red LED lamp is present next to the output terminal to shows normal operation when a 20-50V source of the correct polarity is provided to the input. The typical Idle current drawn from the 20-50V source is 15ma with no load on the output. On many vehicles, particularly electric forklifts, the nominal supply voltage of 24 or 48 Volts may seem like a simple supply to regulate from. In practise, such electric vehicles can generate prolonged spikes of 150V or more, in the positive or negative direction. This harsh environment has a reputation for trashing electronic systems and simple voltage converters with minimal protection. 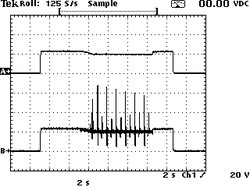 The adjacent input/output image taken from a forklift moving a load, shows how the noise on the lower trace has been filtered and removed from the output of an SM106 unit as shown on the upper trace. The unit is flange mounted and has a two-way screw terminal that should be connected to the + and – of the vehicle battery. Ideally this should be a cable running directly to the battery terminals to further reduce noise and voltage drop problems. The 12VDC output appears at the second screw terminal strip. IMPORTANT – Where possible, the chassis or negative rail of equipment connected to the output should not be earthed to the vehicle body. This is for noise reduction purposes as the negative output of the module has also been filtered within the SM106 unit.